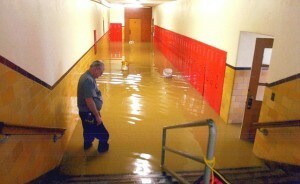 Water damage can hit your commercial property in Las Vegas at any time. Regardless of whether the damage occurs from a broken water line or a weather related event, every hour spent cleaning up is an hour of lost revenue and productivity. Proper extraction and drying techniques help minimize the possibility of additional damage and potential microbial growth after water damage occurs. It will also help minimize costs. Drying out the affected areas quickly and efficiently requires specialized methods and equipment by trained experts. Always make sure your primary focus is safety! Here are some tips for commercial property owners in Las Vegas who are faced with water damage. Do NOT use home or shop vacuums to remove water, to avoid the risk of electric shock. Do NOT turn on heating or air conditioning units if the situation is sewage-related. This may spread contamination. Wash your hands following contact with damaged items. If at all possible, stop the water at its source. Remove loose items from floors. Mop up excess water from floors. Remove colored rugs and other items that may stain floor coverings. Take out wet upholstery and cushions. Pin up any draperies or furniture skirts to keep them as dry as possible and to prevent staining. Position plastic blocks or aluminum foil between furniture legs and wet carpeting. Turn air conditioning on and open windows for maximum drying in summer. Move art and other décor to a dry place. Routine maintenance and regular inspections of the interior and exterior of the properties will help allow you to remedy water intrusions before they cause extensive damage. Always provide new tenants with information about the signs of water damage, water damage prevention tips, the procedure to follow if they notice water damage as well as inspection and maintenance dates. In your disaster preparedness plan, outline how you plan to resume operations if your building experiences water damage. If your commercial property in Las Vegas has suffered water damage, ERX Emergency Restoration Experts will respond anytime, day or night, to help get your business back up and running as soon as possible. We recognize how important it is for your business to continue operating to reduce the impact of water damage on your profits. Contact ERX today.